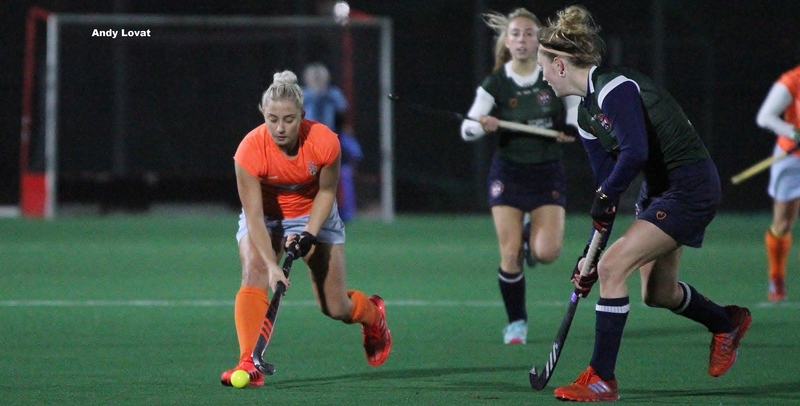 Clydesdale Western closed the gap at the top of Women’s National Division One following their narrow win against champions Edinburgh University Ladies 1s at Titwood. A win would have meant the L1s would draw level with the student side at the top of WNL 1 – Uni would still be in the lead via a better goal difference. The game itself brought out contrasting tactics as the visitors looked to take the game right from the off to ‘Dale Western with a full press. The home side on the other hand were content to play a half court system designed to hit the students on the counter attack. Clydesdale Western looked to counter attack through Lexi Sabatelli and her forward teammates early on. (Photo credit: Andy Lovat). Just after ten minutes in to the opening period was when ‘Dale Western struck. Following the award of a penalty corner, stand-in captain Frances Lonergan stepped up from defence to slap a ball into the Uni goal. For large parts in the first half, the L1s were getting joy with their counter system up until Uni’s defensive quarter where the final pass was just lacking in attempt to double their deserved lead. Uni on the other hand pushed up, but were thwarted by a solid looking defence in front of L1s goalkeeper, Jessica Buchanan. ‘Dale Western produced a superb defensive rearguard led by match winner, Frances Lonergan. (Photo credit: Andy Lovat). The second half was more of an onslaught from the visitors but were denied through a combination of saves from Buchanan and brave blocks from the ‘Dale Western defence led impressively by Lonergan. The home side had the odd chance to finish the game as counter attack opportunities went by, most notably through Emma McGregor who overran the ball having beaten the entire defence to leave herself one on one with Edinburgh Uni’s ‘keeper. Emma McGregor impressively beat a number of Uni defenders on her own, but agonisingly overran the ball through on goal. (Photo credit: Andy Lovat). 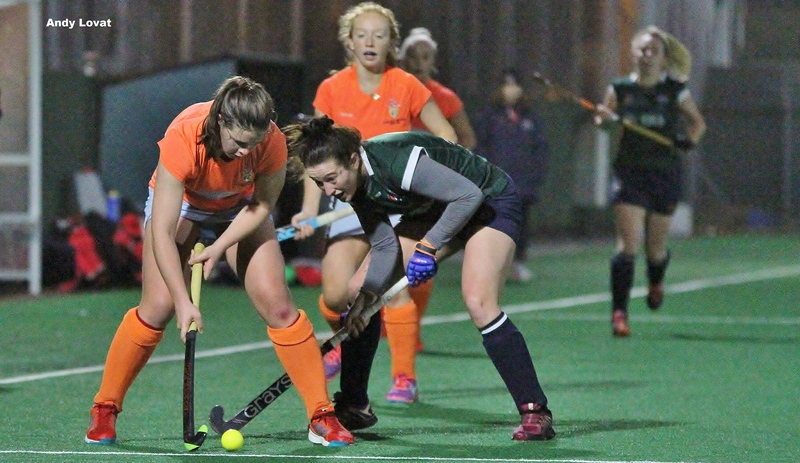 The missed opportunities had no bearing, however, as Clydesdale Western narrowed the gap to just goal difference going into their clash with Glasgow University the following day. 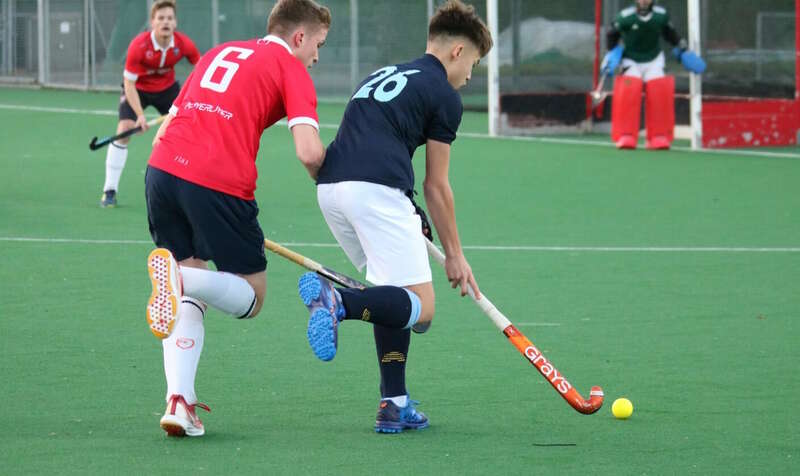 Clydesdale Men’s 1s stopped a run of four home losses and reignited their bid to finish in a top four play off spot in Men’s National Division One as Ewan Fraser inspired his side to a crucial win against Edinburgh University Men’s 1s at Titwood. Clydesdale started their fifth home league game in a row in positive fashion in the first half and took a deserved lead in a move that brought out the best in youngster Ben Galloway. Youngster Ben Galloway showed tremendous strength and composure to set up Clydesdale’s opener. (Photo credit: Rhona Weir). Galloway drove down the right to set up Struan Walker for an opportunity. Walker’s upright reverse was saved by the Uni ‘keeper but Fraser was on hand to tuck in the rebound. The M1s, featuring Euan Lindsay (pictured), produced a strong first half to go in 1-0 up at half time. (Photo credit: Rhona Weir). In the second half, the visitors responded by committing to a press inside ‘Dale’s half and got themselves an equaliser. The press continued as the student side looked more likely following chances that were denied by defensive interceptions and saves from Clydesdale goalkeeper, Sean Mahoney. The visitors were made to regret these misses when the home side finished off an unerring counter attack from back to front. Captain Gordon Amour produced a slide rule pass for Fraser who sublimely lifted a shot over the on rushing Uni goalkeeper to double his personal goal tally but more importantly regain the lead for Ciaran Crawford’s side with over ten minutes to play. Uni pushed hard for a second equaliser but were denied by Mahoney. The visitors, who took off their goalie in favour of an extra outfield player minutes from time, did beat Mahoney but were further denied by the post as Clydesdale held on for a vital three points. Visitors Edinburgh University M1s pushed hard for a second equaliser, but David Nairn and his ‘Dale teammates held firm until the final whistle, (Photo credit: Rhona Weir). The result and scores elsewhere means ‘Dale move up to 6th in MNL 1, four points and a game behind Hillhead in fourth place. In the rest of Saturday’s games, the four remaining men’s teams all suffered defeat. The M2s were the closest to a point who were 2-0 down away to Grange 3s – conceding a goal in each half. Despite Colin Moulson’s sweeping finish with ten minutes to play, the M2s could not find an equaliser as Grange 3s held on for a 2-1 scoreline. The M2s sit ninth in Men’s Regional Division One, two points clear of Inverleith 2s. The M3s, M4s and M5s all finished scoreless in their respective games. 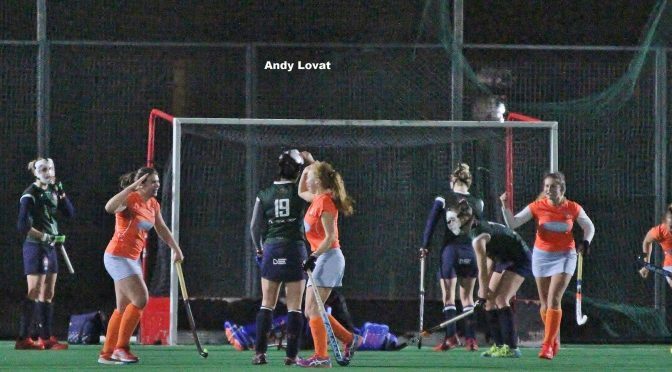 The M3s were seen off from a strong Uddingston 2s side, while the M4s were beaten by Rottenrow 2s – both games finished 4-0. The M5s went one worse at home to Western Wildcats 4s to lose 5-0. The M3s sit fourth in Men’s West District Division One. In Division Two, the M4s sit in seventh whilst in Division Three, the M5s are second bottom of the table. The L3s also lost their Saturday clash away to George Heriots FP 1s following a 2-0 reversal. The L4s picked up three points away to Hillhead 3s to lift themselves into 3rd in Women’s West District Division One, thanks to goals from Cat Stirling and Anais Bonner. The L5s boosted their relegation survival hopes following a 2-2 draw away to Stepps 1s. A goal each from Lauren Halley and Catherine Clark means the L5s sit sixth, five points clear of the bottom two in Women’s West District Division Two. The L6s also took a valuable point in their bid to avoid the drop in Women’s West District Three as they held Stepps 2s. 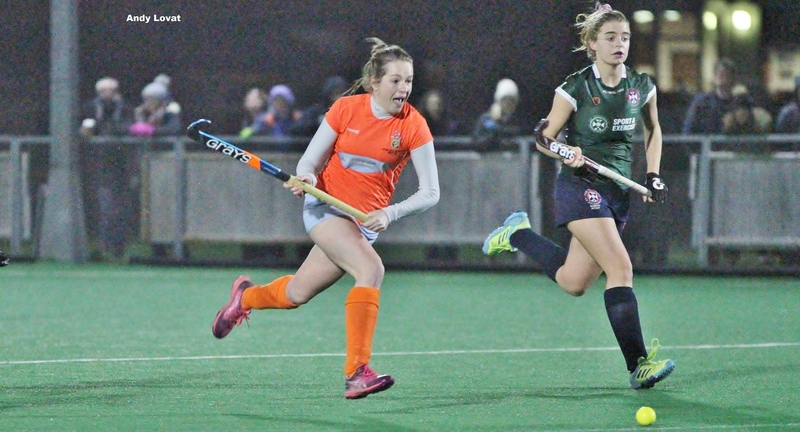 Charlotte Martin scoring the L6s goal in a 1-1 draw. To find out how our Clydesdale Western teams got on on Sunday, please click here.